Culture and Sports Minister Miri Regev tears us as she hears Israeli anthem played for first time Arab Gulf state. An Israeli minister attending a judo tournament in the UAE was brought to tears Sunday, as she heard her national anthem played at the event, in another milestone towards rapprochement with the Arab world. Culture and Sports Minister Miri Regev's presence in the United Arab Emirates capital Abu Dhabi marked the first time a minister from Israel attended a sports event in the Gulf, Israeli officials said. 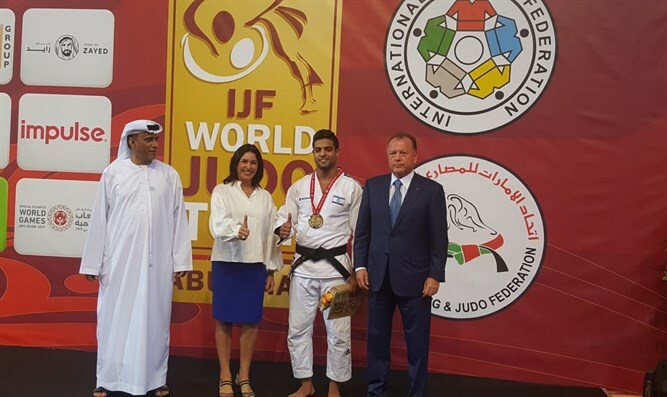 It is also the first time an Israeli delegation participates there under its national flag, after the International Judo Federation warned UAE organizers they would cancel the competition unless all athletes were allowed to participate on an equal footing. Last year, tournament organisezs in Abu Dhabi banned the flag and national anthem of Israel, which has no diplomatic relations with Gulf states. "I'm very proud to be here in Abu Dhabi representing Israel along with the judo team and our flag," Regev wrote on her Facebook page. "I hope we win a gold medal and experience the thrilling moment of playing Hatikvah in the Abu Dhabi arena," she said, referring to Israel's national anthem. Three Israeli judokas won bronze medals on Saturday, the first day of the Abu Dhabi Grand Slam, with Regev given the honor of awarding the medals for one of the categories. Regev's trip to the UAE, which began on Thursday, coincided with Israeli Prime Minister Binyamin Netanyahu's visit to neighboring Oman, the first for an Israeli leader since 1996. And on Monday, Communications Minister Ayoob Kara was to travel to Dubai to represent Israel at an international internet security conference, his office said. Netanyahu has long sought a rapprochement with other Arab states. Speaking of his Oman visit at a cabinet meeting Sunday, Netanyahu said it was thanks to his "diplomatic efforts" in the Arab world, adding: "There will be more."